Most high school guidance counselors encourage prospective college students to apply to as many as eight schools — from dream destinations to likely matches to safe selections where the odds of acceptance are sky-high. At Timberland High School in the St. Louis suburb of Wentzville, Jarrett Harkless had little interest in that well-worn formula. 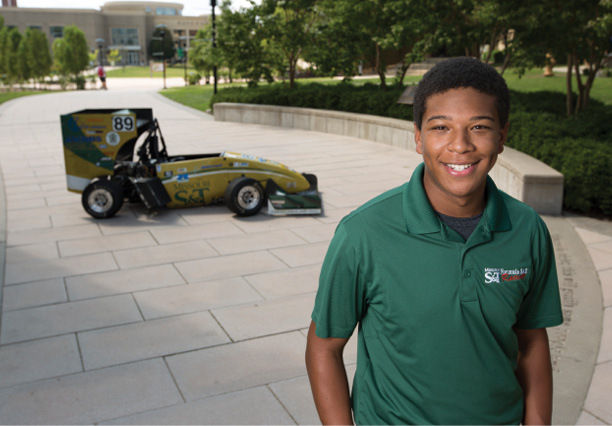 A classroom poster of an open-wheel, student-designed and -built race car instead guided the sophomore mechanical and aerospace engineering major toward a different formula — the Formula SAE racing team at Missouri S&T, the lone university Harkless considered attending. Harkless caught the racing bug after taking a series of high school engineering classes through Project Lead The Way, a nonprofit organization that works to boost K-12 education in computer science, engineering and biomedical science. Missouri S&T is the state affiliate for the national program, with hundreds of educators from across Missouri and the country coming to Rolla each summer for teacher training. The Formula SAE team’s recent performance has been impressive. In May, the squad finished seventh at a Michigan International Speedway event. Then came a first-place win in June at the Formula North competition in Toronto — a victory Harkless calls the first by a U.S. school at that event. That was soon followed by a fourth-place finish at a Lincoln, Neb., race that Harkless compares to the sport’s national championship. In the coming season, the team is ranked ninth in the world — out of 531 teams. “We’re very proud of where we are as a team, going toe to toe with these giants and still doing really well,” he says. The Formula SAE team is one of 18 student design teams at Missouri S&T. The student-led teams not only design and build race cars, rockets, robots, concrete canoes, solar homes and more, but also develop business and marketing plans while working with advisors both in industry and on campus.